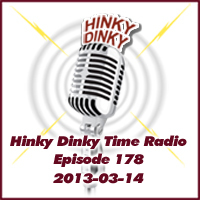 Hinky Dinky Time Radio, Episode 178 – Hinky Dinky Parlay Voo? Episode 178: Thursday, March 14, 2013 at 8:00 PM, Central Standard Time. Old Lonesome George The Basset (aborted) – ?? ?